Veering from my usual blog posts addressed to HR leaders, this post is for job seekers everywhere. Looking for a new job can be painful. In a digital world where HR often seems more like a do-not-reply inbox than an actual human, it can be extremely difficult to ensure your resume gets noticed. If I add up all the time I’ve spent looking for jobs, we’re talking about years of my life. In the early days, I remember so often thinking, “If I could just get an interview, I could show them how amazing I am!” After completing innumerable applications, meeting with many resume experts, and scanning thousands of resumes as a recruiter, I’ve learned some keys that help get my resume noticed and get me those interviews. Today I want to share with you 6 resume tips that will hopefully help you get noticed, in a good way. Many recruiters see hundreds of resumes per week, so they learn to quickly scan for the information they need. In most cases, that scan is in the shape of a right triangle – across the top and then down the left side, noticing less and less of the information on the right as they move down the page. And what about that second (or third, or fourth) page? They almost never make it that far. It doesn’t matter if you have a PhD in Biogenetics and published 47 papers in world-renowned journals (unless you’re in academia, which is a completely different story). Be succinct. Keep your resume to ONE PAGE, and make that one page count. 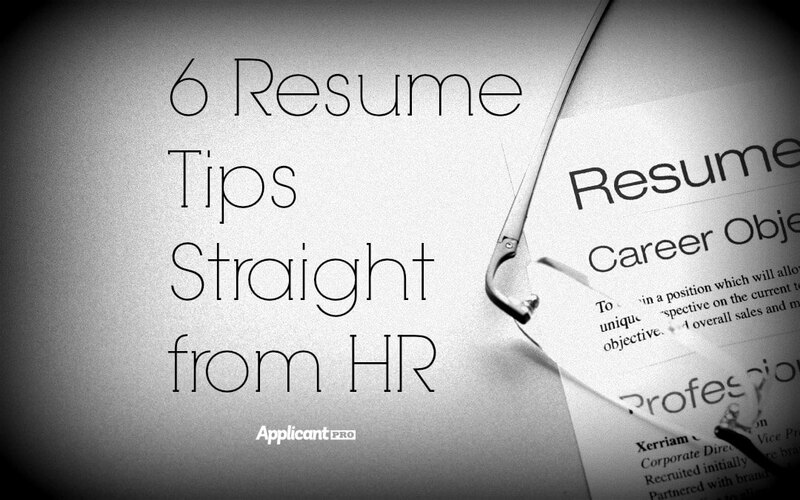 Keep your resume to ONE Page, and make that one page count. I’m often asked by job-seeking friends which font to use or how much white space they should leave and where. As an HR manager, I’m less worried about the specific spacing, font, colors, etc. I mostly want to see that you are consistent. If you decide to bold the name of the company and italicize your job title, then do that every time. If you want to use both the month and year for job dates, then do that every time. No exceptions. To use a popular cliché, I can’t even. Mistakes on your resume give the perception that you don’t care about the job enough to bother with things like accuracy. At the absolute very least, have one other person proofread your resume for mistakes, even if not for content, before applying for a job. Help the recruiter put your story together by including dates, beginning with the most-recent. As much as possible, don’t leave the recruiter piecing together a timeline or wondering about gaps. And unless you have an extremely relevant experience from 25 years ago, then you only need job information from the last 10-15 years. That volunteer project you did in high school likely won’t impress a recruiter when you’re applying for your third job since college. Just like a good suit, a good resume needs tailoring. It’s ok to have a standard resume as a starting point; however, it’s better to tailor your resume according to the position for which you are applying. Read the job description and include relevant experiences that address the company’s specific needs. You shouldn’t stretch the truth or copy exact wording from the job description, but your resume should be topically relevant. As a recruiter, I want to know what you actually accomplished. I’m not looking for you to write a job description of your prior positions. Use action words. Quantify your results whenever possible. Tell me how you contributed and left the organization better than when you joined. If you follow these 6 tips, not only will your resume look more polished and professional, but you will stand out from the thousands of others who slap together a few dates, job titles, and job descriptions and call it a resume. How has following these guidelines made a difference in your job search?